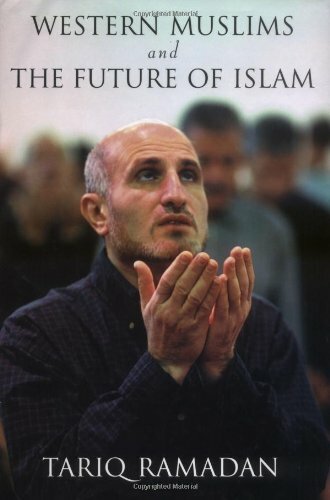 WESTERN MUSLIMS and THE FUTURE OF ISLAM Oxford Univ. Press. The preface has left me surprised...perhaps it shouldn't have and yet maybe it should. The perinas sophia has returned. I had not expected this from the grandson of Hasan and yet maybe this is what I can expect from such a thinker. Had a harrowing experiance with my ticket today - oh how the preface resonates and brings the memories of those strange hours of today back onto me. The humility that sought to wipe off the frustrations of my own shortcommings and how it now floats behind me - forever. How indespecable the individual "I" can reach - saw it on display over the cathode tube after the preface and how worst are those who remain silent. Would would 'X' say . . . "Power only understands Power". Recently I had expressed my personal frustrations in "Nuclear Crossroads of Mine", therein I was able to extrapolate my inner wrestlings with certain idosyncrasies of mine. Those where the inner reasons yet among the outer, it's the bickering between different models available before me. I now long and look towards an all inclusive model as mentioned by a certain speaker at the Revival Conference. Although I have realized on one hand what I would like to move towards . . .and yet the means, the real-life issues and the reactions from others since then haven't had the right positive momentum. People are still and will always be stuck with "what they've learnt from their forefathers"., the "other" is always acted towards with hostility. My interactions in the first year of Nuclear Engineering have made me realize more than ever - that at our current cross-roads we yet again need a new model. A model that includes all the groups even if they are rallied against each other with the fierest proponents of controversy we need a new proactive understanding that is willing to say "I believe in the One Transcendent God". Period. Here is where I look forward to "Western Muslims and The Future of Islam".
' There is no Islamic Theology ' - For some strange reason I agree with that...more on that when I shall be able to articulate it. After reaching to "Revelation: Principles and Tools". I can summerize the intent of the author as such: He seeks that we understand our first principle frame of reference which is inbued in Tawheed and the fact that we have already bore witness to our creator and his absoluteness. "The idea that an intelligent being may find itself alone, abandoned, a prey to doubt with no landmarks in the midst of the "tragedy of life" is alien to Islam: God always makes available to humankind tools and signs on the road that leads to recognizing Him." The chapter ends with a proper classification of all the current 'models' and ranks them with respect to ijtihad and other factors. To be able to clearly synthesize the different movements and schools of thoughts in an appropriate fashion as such is a mammoth task on its own. I am glad Ramadan has touched the different 'Islams'. Now that I'm done with the first chapter and have anchored my own "frame of reference" for the book. I can start jumping all over the place. I'm moving towards the end. I was about to puke after the first bite of the Salamon on board, I immediately got it on a tissue. Couldn't help recalling Farid Esack's mentioning of eating alone in Brazil and calling the waiter upon sensing the taste of Alcohol. As for me - I really wouldn't know if it was the "taste of Alcohol", however I had a lot of reasons for not continuing the inflight meal and I didn't -:). I pulled out "Western Muslims" again, although very much towards the end of the journey. I did what I was waiting for - I read the last chapter and the conclusion. The discussion of what I severly felt was missing from the Muslim life in Western lands ( I'm glad he covered the novels and literature topic as well ) [ or lol - strangly and ironically in westernized lands ] was comprehensively treated and ended with the right conclusions about Western Muslims ( perhaps opposed and different than "Muslims in the West" ) bearing a lot of responsibilty for the new revival - a point that was clearly expounded by Murad Hoffman. Apart from my strange habit of starting with the first chapter - then moving towards "Interest Chapters" - I also ended up going through the footnotes of some chapters as well ( talk about eccentric reading habits ). Now I'll be looking forward to reading some "inbetween material" that refers to the "sciences chart". This is an area or topic that directly relates to a dimension of "differences" that I would like to make in my scientific career [Ameen]. My, my that was an interesting read. 3 names predominately filled my head. Muhammad Asad, Murad Hoffman and Seyyid Hossein Nasr. Ramadan's view is more "insync" with Hoffman's view over "Islamization of Knowledge", both seem to disagree with such a trend. In contrast Nasr presents and raises this issue as well. Science has it's on worldview and so do the Newtonian or Eisteinian concepts - his theory propounds that Ummar Khayyam's work in Algebra would immerse the reader into another world view of things and . . .
Muhammad Asad's statement ( the one about philosophy and morality determining the course of science ) could be summed up with Ramadan's statement: " . . . it means that Muslims must engage, within their own areas of competence, in groundbreaking specialization in all the areas of contemporary knowledge and that, far from becoming intoxicated by that knowledge and changing it into a new idol of modern times, they must make their contribution to the ethical equations it raises. This statement by the author I believe beatifully sums up Asad's intent in "Islam at the Crossroads". Back to the Nasr vs. Ramadan topic. The chart (figure 2.2) does to a certain extent present the moralities issue and relavance to each science nicely however I do believe the third orbit can be merged with the second orbit in areas of theoretical reasearch as mentioned by Asad. However, pragmatically speaking both Ramadan and Nasr's view shall preoccupy my mind for quite some time to come - a cross between the ideas might eventually be my view - God knows best, perhaps I might end up with my own idea over these debatable issues.